We’d love your help. Let us know what’s wrong with this preview of The Spy with the Red Balloon by Katherine Locke. Siblings Ilse and Wolf hide a deep secret in their blood: with it, they can work magic. And the government just found out.Blackmailed into service during World War II, Ilse lends her magic to America’s newest weapon, the atom bomb, while Wolf goes behind enemy lines to sabotage Germany’s nuclear program. It’s a dangerous mission, but if Hitler were to create the bomb first Siblings Ilse and Wolf hide a deep secret in their blood: with it, they can work magic. And the government just found out.Blackmailed into service during World War II, Ilse lends her magic to America’s newest weapon, the atom bomb, while Wolf goes behind enemy lines to sabotage Germany’s nuclear program. It’s a dangerous mission, but if Hitler were to create the bomb first, the results would be catastrophic. To ask other readers questions about The Spy with the Red Balloon, please sign up. I see that this book is second in a series. Do I need to read the first to understand this one? I really enjoyed this book just as much as the first in this series! They read in a way that if you read them out of order you would be okay but I don't recommend missing either book. The way the author intertwines magic and history into a ya fantasy novel is brilliant. Ilse and Wolf are siblings with a special type of magic that comes from their blood. This is World War II and they are both tricked into using their magic for the war. Wolf is a spy working on the Germans to try to keep Nazi Germ I really enjoyed this book just as much as the first in this series! They read in a way that if you read them out of order you would be okay but I don't recommend missing either book. The way the author intertwines magic and history into a ya fantasy novel is brilliant. Ilse and Wolf are siblings with a special type of magic that comes from their blood. This is World War II and they are both tricked into using their magic for the war. Wolf is a spy working on the Germans to try to keep Nazi Germany from being able to succeed with nuclear weaponry. Ilse is actually working with Americans to help further the Atom bomb along. Ilse cant bear not knowing if her brother is okay and sends him letters that he holds dear. Wolf has a flying incident and Ilse's letters are found. She has to prove she isn't a traitor in a time period of great war and distrust. IT HAS A TITLE! The Spy with the Red Balloon will arrive Fall 2018 (if everything stays on track...). Please enjoy my Queer Jewish Kids Punch Nazis While Doing Science and Sabotaging Hitler book. 1. This is not a sequel. It takes place about 45 years BEFORE the first book and has only one overlapping secondary character. Same world, different characters. 2. This is literally all I can tell you. Not because of publishing secrets but because the book isn't written yet. When I can tell you more, I will! New review: now that I've read this, I'd DEFINITELY say It deserves five stars. What do I do now that I've finished such an amazing, complex, suspenseful historical fantasy?! Full review here. I just can't get over how quickly and deeply I fell for these characters. As in the first book, some of the science and magic stuff went over my head, but I really didn't care. The writing is just so gorgeous, the characters so special, and the stakes so high I read this in a state of panic that was partly deserved but so well worth it. My feelings about this book are intense and therefore completely indescribable, so this is going to be an utterly useless review. Like, it has flaws? I definitely thought at times that the writing could just be overall better, and that it was too slow, and that it was somehow just not giving me enough even though I loved every concept in it. You know when you like a book but are at the same time completely exasperated by it? I think this book needed to give us more about Ilse's friends and how th My feelings about this book are intense and therefore completely indescribable, so this is going to be an utterly useless review. Like, it has flaws? I definitely thought at times that the writing could just be overall better, and that it was too slow, and that it was somehow just not giving me enough even though I loved every concept in it. You know when you like a book but are at the same time completely exasperated by it? I think this book needed to give us more about Ilse's friends and how their relationships grow and deepen, and on Wolf's side needed to make us understand Lily more, because to be honest I felt like she was kinda flat, despite her importance, so overall her character is just weirdly handled. But those problems weren't always problems. When there were fewer characters on screen, the relationship between Wolf and Ilsa really shone. I really liked the romance between Wolf and Max. And I've always liked Katherine Locke's version of magic as a science, even though it's kinda vague because, you know, she can't actually give us the magical equations Ilsa writes. Obviously, that would out magic to the whole world, and we can't have that. And most importantly? Most fricken importantly? QUEER JEWS PUNCHING NAZIS. I LOVE Wolf and Ilsa unapologetically going into the war exactly because they know their country isn't in it to save the Jews, but screw it, they are. They're Jewish and that grounds them. It's what puts them in danger, but it's also what inspires them. And they both discover in the process that they're definitely not straight, and even though that's also dangerous for them in this era, well, Katherine Locke is not here to let the nazis win. A wonderful historical fiction novel that has a hint of magic in it. Spies! World War II! Math and science and magic all intertwined! Big difficult philosophical questions! Historical fiction including characters of diverse races and religions and sexualities! Complicated sibling and friendship and romantic dynamics! SO MANY THINGS I LOVE ALL TOGETHER. UPDATED 10/2: Read my blog post about the book and interview with author Katherine Locke right here! "Get in, losers," she called out. "We're blowing up Nazis." In a companion story to The Girl with the Red Balloon, the stakes are high as America joins the second World War. The government is tracking people with magic abilities, drafting them for the fight. Ilse and Wolf Klein are caught in the middle of practicing and are separated to do their necessary part in ensuring America’s survival. Combative Ilse is sent to lead a group in the Manhattan Project where a spy threatens to spill their se "Get in, losers," she called out. "We're blowing up Nazis." In a companion story to The Girl with the Red Balloon, the stakes are high as America joins the second World War. The government is tracking people with magic abilities, drafting them for the fight. Ilse and Wolf Klein are caught in the middle of practicing and are separated to do their necessary part in ensuring America’s survival. Combative Ilse is sent to lead a group in the Manhattan Project where a spy threatens to spill their secrets. Wolf is trained to be a spy where he unexpectedly collides with an old friend. Both work to understand the properties of their strange blood and what uses they could have beyond killing, and Ilse and Wolf are aware of what being Jewish means in the war effort. This is an excellent read that has made me loudly cheer at each heroic fight, the relatable Jewish-ness, and how she perfectly worked in a Mean Girls reference. I highly recommend reading this and be sure to have a copy of The Girl with the Red Balloon to enjoy the moment even more. I've received the arc from Edelweiss in exchange for an honest review. All opinions are my own. This exceeded all of my expectations, and then some. I'm going to be recommending this at every opportunity. Please Note: I received an advance copy of this book from Edelweiss in exchange for an honest review. This did not influence the opinions of my review in any way. Reading The Girl With The Red Balloon last year, I was struck by how the author, Katherine Locke created both an historical novel, and an imaginative fantasy novel. 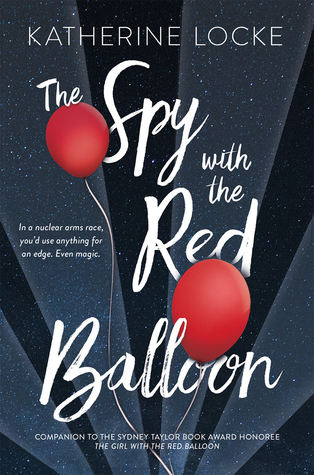 Her newest book, The Spy With The Red Balloon, takes place in the same universe of magic, but with a different historical setting and characters. Once again, I am blown away Please Note: I received an advance copy of this book from Edelweiss in exchange for an honest review. This did not influence the opinions of my review in any way. Reading The Girl With The Red Balloon last year, I was struck by how the author, Katherine Locke created both an historical novel, and an imaginative fantasy novel. Her newest book, The Spy With The Red Balloon, takes place in the same universe of magic, but with a different historical setting and characters. Once again, I am blown away by the intricate plot, suspense, and historical details. Once I started reading, I could not put it down! The book takes place during the second world war. The race is on to see who will create the first atomic bomb: The Americans, or Hitler. I loved all the details of that time that the author includes. From food shortages, and horrible beer to the institutional sexism and racism of the era, I felt these characters were definitely of that time. The book centers on Jewish siblings, Ilse and Wolf. They both have magical blood which enables them to perform enchantments. But younger sister Ilse has the added talent of being a intellectual genius. At sixteen, she is already a university student when the military calls on her (forces her) to use her magical abilities in the war effort of WWII. Wolf, being a few years older, is also pushed into magical service. I really liked Ilse. She is so young and immature to be thrown in with adults much older than she. Not only is she trying to solve an almost impossible puzzle, wrestling with the ethical implications of war, but she is also trying to navigate her attraction for another girl. Being the 1940's, this is fraught with taboos, and danger. I loved her spirit, and her conscience. Wolf also grapples with the ethics of war. He would much rather not kill anyone. But when he faces the realities of what Jews are dealing with in Europe, can he turn a blind eye to their suffering? He is also feeling conflicted about his romantic feelings toward his childhood friend, Max. Again, we are reminded that being Gay was not just frowned upon back then, but illegal. I loved that there were not one, but several gay characters, as well as African-American characters, in this book. These were multi-faceted people who were not solely defined by one trait. The plot has many twists and turns that kept me reading well past my bedtime! Like any good mystery, there were clues and foreshadowing that the reader could glean. But, when some of the twists were revealed, it was yell-worthy (which I did do, loudly)! The book had a sense of urgency throughout that I thought worked really well to convey how all encompassing the war was for everyone. Not only life, death, and freedom hung in the balance, but also ethics, at both a personal and national level. Are we willing to kill for our country? Are we okay with creating weapons that can kill millions? What are our responsibilities? eh I'm not feeling it. I doubt I'll pick this one up again, so it's on the dnf shelf for now. This book was just as good as it's companion novel, The Girl With The Red Balloon. I loved how realistic this book was and how it made the magic seem possible. The writing style was brilliant and I can' t wait to read more by Ms. Locke. The characters were also very well written and I loved them with all of my heart. The plot was very intense and I was kept on the edge of my seat the whole book. This is a wonderful companion to The Girl with the Red Balloon. I love Ilse and Wolf so much. Ilse is unapologetically smart and resourceful. Wolf is very protective of the people he loves. Their relationship with each other works so well. They recognize each other's strengths and play off of that, even when they are apart. The Spy with the Red Balloon felt, at times like a prequel. I don't want to say too much so that I don't spoil anything, but it sets up a lot of what we see in The Girl with This is a wonderful companion to The Girl with the Red Balloon. I love Ilse and Wolf so much. Ilse is unapologetically smart and resourceful. Wolf is very protective of the people he loves. Their relationship with each other works so well. They recognize each other's strengths and play off of that, even when they are apart. The Spy with the Red Balloon felt, at times like a prequel. I don't want to say too much so that I don't spoil anything, but it sets up a lot of what we see in The Girl with the Red Balloon. As a companion and a prequel, it complements TGWTRB very well. This was a bit of a slow start for me, but I loved Wolfe and Ilse from page 1. As it went on, it became more and more addicting and I was desperate to get to each chapter and make sure everyone was okay. Also this was SO queer, which was wonderful. I received a copy of The Spy with the Red Balloon from Netgalley. I had heard a lot of good things about the first book in this companion series The Girl with the Red Balloon, which I have unfortunately not had the time to read yet. They are both historical fiction novels set at the time of World War II, that have magic in it, and Jewish main characters. This book is #ownvoices for Jewish representation. While reading this, I k I received a copy of The Spy with the Red Balloon from Netgalley. I had heard a lot of good things about the first book in this companion series The Girl with the Red Balloon, which I have unfortunately not had the time to read yet. They are both historical fiction novels set at the time of World War II, that have magic in it, and Jewish main characters. While reading this, I kept thinking, why had I not read The Girl with the Red Balloon yet!? The book was so good, and I’m definitely getting the first one. Since, I hadn’t read the first one, I can say that The Spy with the Red Balloon works as a companion novel. You understand everything without needing additional knowledge from the first book. The story shows the brutality of Nazi Germany without describing every evil in detail. It focusses a lot more on what Ilse and Wolf are doing to help and how their life continues during the war. Katherine Locke closes up the plot-hole of why not all of the victims were saved, if some people had magic, by explaining that the magic was tied to blood, and the magic users would need to have a lot more blood than they could give to save everyone. The main characters are siblings, and they had such a lovely relationship. They took care of each other, even from afar. It was lovely to find out that both of them were queer, usually books seem to think that there can only be one queer person in a group of siblings, which is just ridiculous. I do head-canon Ilse as aro-spec, and I’d be interested to see if this is the case. They are also quite different from each other, and contrary to popular gender stereotypes, Ilse is a scientist, while Wolf becomes a spy. One of the major scientist characters is a black female scientist. Through Stella’s story, the reader realises that even though Jewish and black people both experienced discrimination, the communities were affected in different ways. Stella also makes the reader aware that just because a place thinks that it is not racist, doesn’t mean that that is the reality. I especially loved how the four scientists (who were all women) became closer to each other, and started to help each other out. It’s lovely to read about friendships between women, where the women are accepted for who they are. The aroantagonistic phrase of “just friends” is used at least twice. You should definitely get this book. It’s soooo good! I will definitely be reading The Girl with the Red Balloon soon. It was beautiful to read a book that focussed on sibling relationships and friendships between women. Wow, this book is good. It's a companion to The Girl with the Red Balloon , and it's absolutely just as strong as its predecessor. Which is a hard feat, because I loved its predecessor, so. The only minor qualm I had was that a few things were a bit predictable- but honestly, it didn't really dampen the impact of the story, so whatever. So let's go ahead and talk about the stuff I loved! •The time period. Look, a book set (and done right, which this certainly is) in WWII era is probably going to pull at the heartstrings. This certainly did. •Ilse and Wolf are incredible characters. Not only were they each incredibly sympathetic and well developed, but their sibling bond was incredible. It was also really believable, which is hard to accomplish. These two didn't want to be separated, but in the end, it was really good for each of their personal growth. Of course, their bond never faltered either, so it really was the best of both worlds. •There was light in the darkest of places. Truly, it gives me hope for our world now. It's lovely to see acts of selflessness and bravery and goodness in such bleak and desperate times. •It's incredibly emotive. There is so much going on that really made me feel things. Not only is the obvious horror of the war raging on in Europe, but even in Ilse's American small town, the awfulness of racism and homophobia is everywhere. You can't help but feel angry, sad, and scared for these characters. •The tension and the stakes are, for obvious reasons, incredibly high. This book keeps the action coming, because of course it has to. There is so, so much on the line, and everyone involved knows that it is so much bigger than just themselves. It makes for a very powerful novel, to say the least. Note to self: don't read the sequel first. I love this series way too much. By far one of THE best books I have ever had the pleasure of reading. It was thrilling, suspenseful, heartbreaking and heartwarming all at once. I won't lie, I was scared as hell the entire way through, but each character and each part of this book have left an imprint on my heart and I am so glad I was able to read it. I can't even imagine the research that went into this book. I don't even know what else to say. It's a book that, once it's finished, leaves you a little speechless. Thank you for By far one of THE best books I have ever had the pleasure of reading. It was thrilling, suspenseful, heartbreaking and heartwarming all at once. I won't lie, I was scared as hell the entire way through, but each character and each part of this book have left an imprint on my heart and I am so glad I was able to read it. I can't even imagine the research that went into this book. I was so excited to read this book because I adored The Girl with the Red Balloon; and this prequel is rich in history, magic, troubling grey areas, and beautiful language in the same way. The unique thing that I love most about it is the sibling relationship between Wolf and Ilse--their closeness and their clashes and similarities and perceived inadequacies and deep understanding and constant sniping. It's a relationship that gets you invested right away. And as comforting and familiar as it in I was so excited to read this book because I adored The Girl with the Red Balloon; and this prequel is rich in history, magic, troubling grey areas, and beautiful language in the same way. The unique thing that I love most about it is the sibling relationship between Wolf and Ilse--their closeness and their clashes and similarities and perceived inadequacies and deep understanding and constant sniping. It's a relationship that gets you invested right away. And as comforting and familiar as it initially is, it has to evolve in difficult ways as they are separated for the first time in their lives and have to pursue their own storylines, their own relationships. Some of the ways they each change during the war are heartbreaking. And, knowing what happens in The Girl with the Red Balloon, you can see how the effects of their changing will ripple outward, and how they might make mistakes they wouldn't have before. But their relationship doesn't *weaken*, and that ends up feeling like reason for hope. Their other relationships are compelling in and of themselves, too. I'm particularly attached to Stella, the delightfully dry and practical genius who is also the lone black woman in the group of magic-users assembled around Ilse (and I appreciate that the other women's respect for and friendship with her doesn't get anyone a free pass on allyship); Lily, the MI6 operative leading Wolf's mission, who is a badass and hasn't had to have all her femininity and softer feelings stripped away to make her into one; and Max, Wolf's lifelong best friend with the potential to be something besides a friend. I would have liked for Max to be developed more, actually, as his own person; but it was nice to eventually get to see him from Ilse's POV, and be reminded that he exists outside of Wolf's perception in ways Wolf doesn't even think about. The first-person narration manages to convey the adolescence and...*siblingness* of the characters while also feeling oddly literary; I like that about Locke's style. This book definitely feels of a piece with The Girl with the Red Balloon. There are a couple deliberately anachronistic lines, but they're so damn satisfying that I can't bring myself to mind. Most of them have to do with punching Nazis. Some of the morality in the book is a bit more uneasy than Nazi-punching, which is to be expected of a story dealing with the Manhattan Project. On that front, the book is definitely aware of the moral dilemmas. It's even aware of the issues with being too black-and-white about anything--not that certain things aren't irrefutably wrong, but that rigidity and idealism can both cause problems down the line. Like Girl with the Red Balloon, though, it chooses to be less aware of certain things. Sometimes it's sticking to the constraints of the time period, as with the few mentions of Israel--the characters in the midst of the Holocaust are thinking of safety, not the horrifying situation Israel will eventually become, but the latter is always at the edges of my mind. Sometimes it just feels like something's been forgotten, as when the leader of the nascent balloonmakers says he hopes their rescue services will never be needed in America, which has in fact been rounding up its own citizens in concentration camps on the basis of ethnicity for a year by the time the book starts. These moments made me uncomfortable, but I also don't feel like I can blame the characters for having their all their focus taken up by the Holocaust. I'm also rather emotional about how this book deals with its characters' Judaism, since it's central to the Jewish characters' identities and to the setting itself but each of them has a different relationship to it, and it's only one part of some very complicated patchworks...I have trouble articulating my emotions since I'm still working on articulating my own relationship with Judaism, but I really, really appreciate that Locke's unapologetically and complexly Jewish books exist. My final note is about the queer rep--it's here, and it's lovely. Again, it varies between characters and is only part of the patchwork. The dangers of queerness during the 1940s are present, and some characters may be held back by that while others fail to really understand someone else's fear; they're all working on it, but the focus isn't on fear or tragedy but on kids figuring out their feelings and their identities. And I'm especially gratified by the asexual rep we get in Wolf. The Spy with the Red Balloon is the second book in The Balloonmakers series and written by Katherine Locke. It is centers on sixteen year-old Ilse Klein and her older brother, Wolf Klein, two Jewish, German-American youths living in 1943. They have a closely guarded secret: there is magic in their blood – literally. When they write scientific equations with their blood – magical things can happen. When Isle Klein accidentally sets fire to a kite using her magic and it is witnessed by a government The Spy with the Red Balloon is the second book in The Balloonmakers series and written by Katherine Locke. It is centers on sixteen year-old Ilse Klein and her older brother, Wolf Klein, two Jewish, German-American youths living in 1943. They have a closely guarded secret: there is magic in their blood – literally. When they write scientific equations with their blood – magical things can happen. When Isle Klein accidentally sets fire to a kite using her magic and it is witnessed by a government agent, they are blackmailed into helping America win the Second World War. Wolf Klein is sent into Germany to spy and destroy Germany nuclear labs to slow down or halt their nuclear progression, while Ilse is sent to a top-secret engineering facility in Tennessee with three other magic-users to manifest a nuclear bomb. However, complexities arise when some important documents go missing and Ilse Klein is blamed for treason. The accusation against Ilse effect Wolf, whose Jewish identity makes him even more vulnerable – especially when he is shot down by the enemy and needs his sister's help to find an appropriate magic spell to get him out. I rather liked the fact that the four member team working on the atomic bomb project were all women. Of the four people in Ilse Klein's group, Stella, who is black, is treated differently from the rest, though she is the smartest member of the team. Locke managed to explore the similarities between Stella and Ilse Klein with their shared discrimination, but how very different they are being discriminated against. Regardless, there is a connection between them – it is a shame that it is discrimination. Ilse Klein is also surprised to find herself attracted to another teammate, Polly, and has to do work through her sexual revelation. Furthermore, the entire magical team is also forced to grapple with the ethics of using their intellectual and magical gifts in service of delivering a weapon of mass destruction. It does not help much that there is a leak in within their group and they must be weary of each other. Wolf Klein's challenges are just as daunting. He is in love with his best friend, Max, when the two end up on the same mission. He is torn between protecting Max and completing the mission goals. He and his team face decisions of life and death when it comes to the Nazi soldiers they encounter in Germany, as well as with civilian workers at the sites they are supposed to bomb. The Spy with the Red Balloon was written extremely well. Locke expertly blends historical fiction, action, suspense, and magical realism, the mad such an intricate and rich narrative. It switches between the sibling's perspectives, exploring a multitude of emotional and moral issues, including racism and LGBTQ equality. However, having teenagers – even magical and genius ones – helping with the war effort in significant world changing manner was not explored as much and such it was quite difficult to suspend the disbelief a tad. There are some books that, once you finish reading them, you know for a fact that you're going to read it again. And soon. Both books in the Balloonmakers series are like that. The Girl with the Red Balloon was sweet and smart, and it made my heart ache during my reading and especially after. The Spy with the Red Balloon is no different. I thought I would be upset that Katherine Locke didn't continue the story of Ellie and Kai, but once I met Ilse and Wolf, I knew I wouldn't be upset for long. Il There are some books that, once you finish reading them, you know for a fact that you're going to read it again. And soon. Both books in the Balloonmakers series are like that. The Girl with the Red Balloon was sweet and smart, and it made my heart ache during my reading and especially after. The Spy with the Red Balloon is no different. I thought I would be upset that Katherine Locke didn't continue the story of Ellie and Kai, but once I met Ilse and Wolf, I knew I wouldn't be upset for long. Ilse is a genius, a girl who lives and breathes science and magic. Wolf, her brother, is smart, but he knows he'll never understand as much as Ilse does. He only knows that their blood can perform magical feats, and he understands that the war is closer than he thought. When the siblings are recruited for a secret mission involving Hitler and a nuclear bomb, they know that nothing will ever be the same between them. Ilse is whisked off to the picturesque hills of Tennessee while her brother is shipping off to Germany, right in the middle of the danger. The two must fight against time, racism, and a spy determined to get their way. Let's be honest: right now, we definitely need a heroine like Ilse. She's strong, brave, smart, and willing to stand up to those who try to come between her and her principles. She only wants a better world to live in, one where people can be themselves and be happy. She's idealist in that way, but she understands that this world is not kind to people like her - Jewish, queer - but she knows enough to want to change that. Then there's Wolf. Sweet, sensitive Wolf. This war hasn't only been waged against his people, but it's also torn his best friend Max from him. Once overseas, he's sure of two things: he wants to stop Hitler and he wants to make it back home so he and Max can be together.Along the way, he learns about heartbreak and betrayal, and he sees exactly what is worth fighting for. In a nutshell: these two siblings are badass. Featured in World War II Wednesday on Intellectual Recreation. Last year I read Katherine Locke's The Girl With the Red Balloon, and it made me really curious to learn more about the magical balloonists of the past. Well, I got my wish. In The Spy with the Red Balloon, Ms. Locke takes us back about 45 years to World War II. The story stars siblings Ilse and Wolf. They are recruited to help the war effort with their magic. Wolf is sent overseas as a spy, and Ilse become part of the Manhattan project, working on a way to deliver the atomic bomb with magic. There are some really intriguing things about this book. I do enjoy a good alternate history, and I'm going to slot this one in with other great alternate World War II novels like Wolf by Wolf and Front Lines. I really like the way science and magic overlap in the Balloonist series. I also really enjoyed the sibling relationship between Wolf and Ilse. I was completely on board for the relationship between Wolf and Max. However, I thought Ilse's romance was underdeveloped and frankly unnecessary. Sometimes YA books it feels like there's a need for every character to pair up, and that can feel forced. I would have loved more of an emphasis on Ilse's female friendships. All in all this book has a fun combination of science and magic, daring rescues, lots of danger, questionable morals, LGBT romances, and familial love. The Spy With the Red Balloon is a companion novel to The Girl With the Red Balloon, but they can be read completely separately! I really enjoyed Girl, it had such a haunting tone to it, so I was excited to see what Spy would hold! I almost stopped reading a handful of times. It takes a bit to get acclimated with the world and the science/magic can get very confusing very fast. I kinda just disconnected from it and stopped trying to make sense of it all and that helped! After a bit, things start to pick up and the story really gets going. You have all the points to need and ZOOM! we're off. It took me awhile to get warmed up to Isle. I just had a hard time connecting with her and I only found myself really invested in her story towards the end. I didn't have that problem with Wolf. I was hooked into his POV right from the start. This book does take place during WWII and there is a lot of heavy stuff happening, but this book is just... more than that. There was plenty of queer characters and punching Nazis to go around. I loved it. One of my favorite things would have to be a plot twist. It is so masterfully done that it's such a complete shock. I loved it. You are lulled into a false sense 'oh, duh I know what this is' and then you are completely thrown off guard by what actually happens. It was brilliant. I'm not sure how I feel about Isle's romance arc. She is bi and she does have a crush on a girl and I loved it! It just felt a little rushed and I don't feel I got enough interaction between the two characters to feel completely invested in their feelings. But, there I feel like there is a story off the page happening and that is good for me. It loved seeing the connections to Girl. It was so fun seeing how this book ties into that one! They are more like Easter eggs, so if you haven't read Girl it's no big deal. You will understand everything that is going on! This is the second book in the Balloon Makers series but it's more of a companion novel than a sequel. Both books are set in the same world with the same magic but are decades apart with completely different casts so they can be read in any order. The 'first' book was one of my favourite reads of the year so far and this book, somehow, matched and even bested that. This time the timezone is towards the end of WW2 when the USA has got involved and the science behind the atomic bomb is being discov This is the second book in the Balloon Makers series but it's more of a companion novel than a sequel. Both books are set in the same world with the same magic but are decades apart with completely different casts so they can be read in any order. The 'first' book was one of my favourite reads of the year so far and this book, somehow, matched and even bested that. This time the timezone is towards the end of WW2 when the USA has got involved and the science behind the atomic bomb is being discovered. It's dual POV between a pair of Jewish German-American siblings. I loved Ilse's and Wolf's relationship so much. It read true in the jealousy and love between them and the intense fear of being split up by war. The book also has a whole cast of amazing side characters. The girls Ilse works with to discover the science behind the magic, including a black woman who has to deal with segregation of the army base and a lesbian who Ilse develops feelings for (and let me tell you reading two girls flirting in fluent science was amazing!). On wolf's side he's struggling with thoughts about a friend who joined up before Wolf could really figure out his feelings for him (Wolf is demisexual and the discussion and feelings were dealt with well but I would have loved more of an explanation/mention of his romantic feelings because as it was, it felt like the rep conflated the two which isn't great). Wolf, being army age, also has to deal with using his magic while, you know, being at war and also returning to fight against something members of his family fled. They also both have to deal with the fact that being queer in the 1940's isn't widely accepted which affects their relationships throughout. What I love about both of these books is that they deals with marginalised characters and societal issues so well and yet the story itself is such a fast paced adventure. It doesn't let up. It doesn't feel like I'm being taught but never shies away from real issues. I couldn't put it down. I cared so much, I needed to know what happened next, and I was never disappointed. It simultaneously left me wanting more and yet knowing that if we do get another book it'll probably be with whole new characters again! The only thing I would say is there is some disability rep mentioned right at the end and yet we never really get to see it which was disappointing for me. I would have loved an extra chapter to show it on page rather than being told about it by another character. I'd recommend these books to anyone who love fast paced adventures because simply as that they are amazing but they also centre a diverse cast and issues. I loved this so much! Rep: bi Jewish German-American girl, gay demi Jewish German-American boy, gay and lesbian side characters, m/m, f/f, and a black female scientist side character.